Nocatee is already one of hottest destinations for new homes in Jacksonville. Thanks to a couple of new, just-announced attractions, that trend is only going to grow stronger in 2018! Nocatee’s newest attraction is Nocatee Landing, located along the beautiful Tolomato River, is the perfect place to enjoy Nocatee’s natural beauty and family atmosphere. In addition to beautiful walking trails, the Landing will also feature water access, an open-air pavilion, and on-site parking. Conveniently located in Nocatee’s Crosswater neighborhood, Nocatee Landing will offer residents incredible outdoor amenities mere minutes from home. That combination of outdoor living and modern amenities are the reason that Nocatee is such a sought-after area for anyone looking to buy a home in Jacksonville. Adding to the excitement is The Schoolyard, scheduled to open this summer. 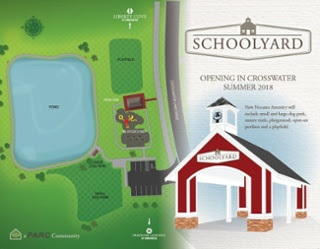 Located in Crosswater between Liberty Cove and Freedom Landing, The Schoolyard will offer two dog parks, a playground, nature trails, an open-air pavilion, and a playfield. It’s a perfect place for families to visit together and for neighbors to build a sense of community. These amenities are why Nocatee is Jacksonville’s hottest spot for new homes, and improvements like these are only going to continue. Whether you’re starting your family or looking to retire, Nocatee is an incredible place to live. If you want to learn more about what Nocatee has to offer you, call Kelly and Wanda today!